February is here and there are less than 3 weeks left for the Oscar night. Starting with Frost/Nixon, I review the important movies in the Oscar race and try determine who is worthy of winning and who isnt. Oscar winner Ron Howard, who has made a mixed bag of movies like A Beautiful Mind, Apollo 13, EdTV, Da Vinci Code, Cinderella Man among many other is back with a project which deals with The Nixon interviews. After The Watergate Scandal, which is one of the biggest scandals in American political history. Richard Nixon had resigned and maintained a low profile after being granted pardon inspite of public protests against the scandal. Around this time David Frost, a British journalist had approached Richard Nixon for a series of interviews. These interviews went on to become a landmark events in Television as the premiere of the first part of the series had 45 million viewers; a record which still stands today. 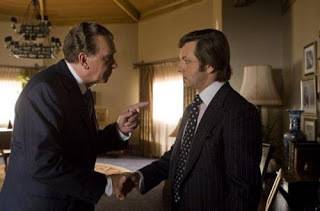 Reprising their roles from the 2006 play of the same name, Frank Langella and Michael Sheen(Tony Blair in the Queen) play Richard Nixon and David Frost respectively. The movie unfolds in a documentary style with various characters narrating what had happened since the break out of Watergate Scandal, through the resignation of Nixon and the arrangement and execution of interviews. The movie is tightly written and the tension is created and maintained properly in the second half. However the scripting of movie could have been better. The documentary style feedback from the characters was quite unnecessary. Ofcourse Ron Howard and team must have had inputs from the actual team present, but I feel they could have done better things with the script. However the good thing was the essence of nearly 6 hours of interviews were well captured for this medium as the movie moved at a brisk pace and made most of the powerful situations in the story. Though Frost's character was well established, we dont get to see enough of his plan and determination to succeed before taking up such a huge project at a great personal risk. Frost's character could have been deeper in the middle part of the movie. I dont know if it is true but the phone call from Nixon during the night and subsequent awakening of Frost seemed a little too cinematic. I have seen the actual interview and found the real Frost to be much more confident than portrayed by Sheen. Frank Langella steals the show by giving a great performance as the money minded, ever hungry for success Nixon. His diction was pitch perfect and sometimes even surpassed that of Nixon himself(compared to what I saw in the interview). The rest of the cast including Samuel Rockwell, Rebecca Hall and in particular Kevin Bacon did a good job. Overall the movie is pretty good entertainment inspite of its shortcomings and definitely worth watching. It has 5 oscar nominations, the best movie, director, lead actor, editing and best writing based on previous material(the play). Frank Langella is definitely a strong competitor for the Lead Actor oscar and editing was pretty tight too as I said before. However we have to wait and see how other films fare and where this movie shall make its inroads.